Last week I finally got a little smart and bought a new appliance: an electric pressure cooker. We need to be able to cook quickly and with as little heat as possible. If you read this site you know that I am a long-time fan of pressure cookers. The problem with them in this environment is that the steam heats up the kitchen. So I finally started looking at electric versions. Turns out there are a few things to learn. For example most of the electric cookers on the market only go to 12psi (pounds per square inch) and to be really efficient I wanted one with 15psi. I could only find 4 that met that criteria. But the most annoying problem for me is that the manufacturers want to over-simplify the experience. So they create a bunch of fancy controls and panels for operations. You need to spend an hour on the instruction book or have an electronics degree. Forget that! 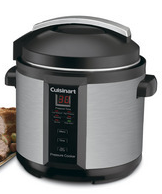 I finally settled on the Cuisinart 1000-Watt 6-Quart Electric Pressure Cooker, Brushed Stainless and Matte Black. When you cook on the high pressure mode, it cooks at 15psi,. I has friendly, minimal controls and a great brand name. 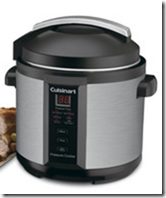 I have had several Cuisinart products over the years and they have always worked well and lasted for a long time. My original Cuisinart Food Processor is well over 20 years old and still going strong. The day it came I got it out of the packaging, washed it and put it to work. Boiled up up 4 lbs of red potatoes in 6 minutes! The unit worked flawlessly and didn’t heat up the kitchen. Since them I have used it to cook black beans, beets, polenta and string beans. My overall impression: I love it! If you have been thinking about getting a pressure cooker; don’t bother with the old-style conventional one; go straight to the electric. The price is actually pretty close to the same. If you have a conventional cooker and are looking for a change or want a great suggestion to add to your Xmas list here it is. Hopefully we will continue to escape hurricanes, finish the kitchen and cool off. This entry was posted in kitchen basics, New Orleans, Whole Food Plant-Based nutrition and tagged Cooking appliances, Cookware and bakeware, food, Pressure cooking. Bookmark the permalink.